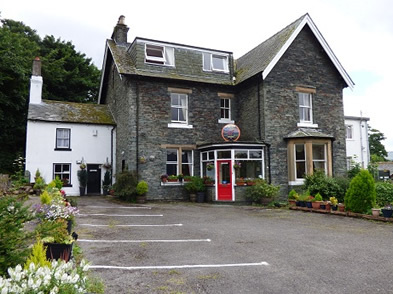 The Heights Hotel offers accomodation in the heart of the English Lake District. The bar stocks local ales and provides home made vegetarian and Vegan meals to residents and non-residents. Set in substantial grounds overlooking the town, with panoramic views towards the mountains: Skiddaw, Blencathra, Cat Bells, Derwent Water and Bassenthwaite. The Heights Hotel will provide you with an excellent base from which to explore Cumbria & the Northern and Western Lakes whether; walking cycling or driving. 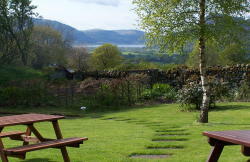 Enjoy a drink and relax; take in the Lakes and fells; Skiddaw, Bassenthwaite, Blencathra and Catbells. Your hosts welcome you with a friendly family atmosphere to The Heights Hotel where we have a 17th century bar and beer garden, ample free parking and many outstanding walks. Ashness Bridge, Derwent Water, Castlerigg Stone Circle and Walla Crag are all easily accessed on foot from our front door. "In the summer months... [ The Heights garden ] ... is perhaps the finest place in Northern Lakeland to enjoy sustenance whilst watching the sun descend.."
All rooms are en-suite with: twin, double and family sized rooms available. Each room has a digital colour TV, tea & coffee making facilities and hair dryers. Residents are able to relax in the comfort of the lounge with views to Skiddaw or to enjoy a drink in the cosy 17th Century bar, with its coal fire and local ales. The Heights is just 5 miles from the Osprey viewpoint at Dodd Wood. Click Here for more details of the Ospreys. ...provide our customers with the highest standards of hospitality and to make your stay relaxed and memorable. ©copyright 2018, The Heights Hotel, all rights reserved.